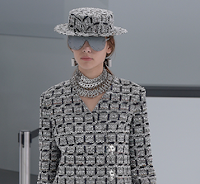 Have been crushing on the Chanel show photos I've seen on my Instagram feed all day (is it socially acceptable to say "lusting over" in the place of "crushing on"? I'll just leave it here in this parenthesis for some emphasis) and just looked into the full show/looks on WWD - really really love so many aspects of this show and collection!! Although I'm still trying to familiarize myself with as many designers and their trademark characteristics as I can (an ongoing process that will probably never reach an end that I'm 100% satisfied with), what I've seen from Chanel and Karl Lagerfeld's work with that design house has been soooo sick. I think what continues to draw me to these collections is that there is always some aspect (or multiple) that I find eccentric - a bit weird, but in a unique and beautiful way. 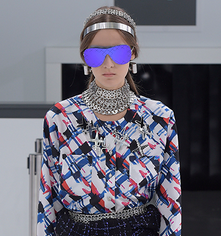 Although some of the looks are quite posh which usually isn't something I'm drawn to, the whole collections are always executed in a way that just looks so edgy and electric and unique, which I'm immediately drawn to in any outfit. This makeup look was just so unique, which is one of the main aspects I strive to incorporate into all my looks and really respect/am drawn to in looks I see on others. 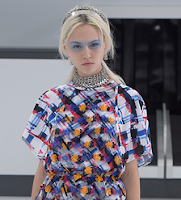 It somehow complemented each look and the overall aesthetic of the show/collection so well, even though you would originally think that blue wouldn't even match with the looks. 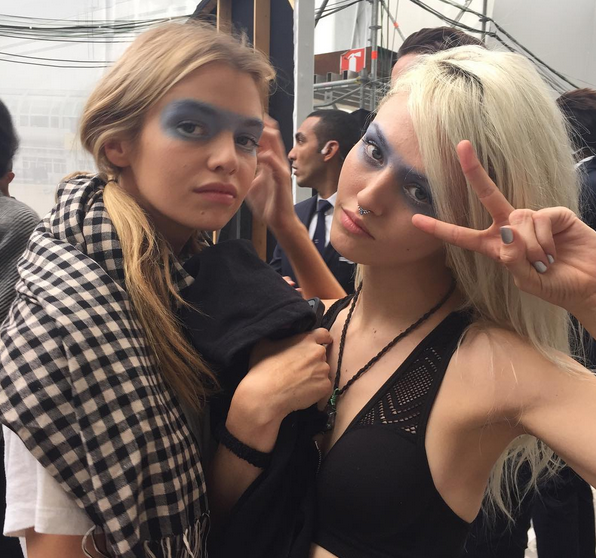 Side Note: My favorite makeup I've ever seen in any runway show was from the Chanel Haute Couture Spring/Summer 2014 show (see left) and the blue eye look in the RTW Spring 2016 show just added to my absolute enchantment with the makeup in Chanel shows. Props, Karl & team. 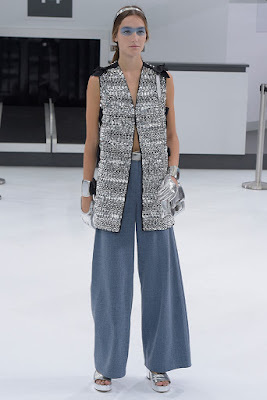 I really love metallic silver to add a little futuristic edge to an outfit lately, especially when incorporated into looks in small quantities like nail polish, purses, hair accessories, eye makeup, earrings, or shoes. 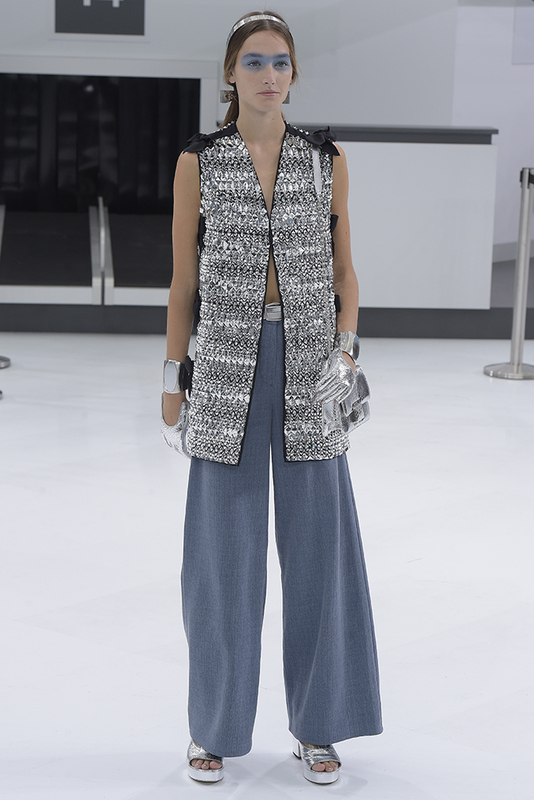 The silver shoes in the show were all really really cool. The collection was obviously cohesive, but there were different little groups that had the same general idea/color palette, and one of these that I particularly liked was a handful of mainly pink looks. 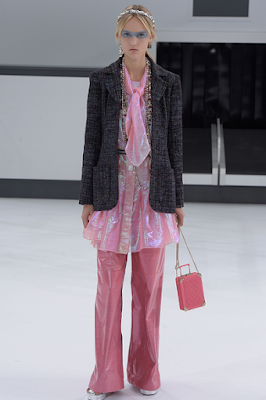 I usually lean towards a more neutral, darker color palette for my outfits but when I saw some of these pink looks on Instagram I was enchanted- they were the looks that made me so eager to look into the show and write this post. They're pretty but so eccentric, cool, and unique at the same time. 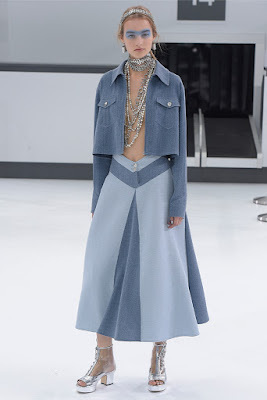 The other little cluster of looks that I was in love with was the looks with denim/blue. 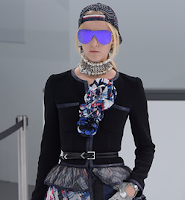 They combined sophistication and beauty (the jewels and mature silhouettes) with youthful street style (backwards hats, loose pants/skirts, and slightly slouchy jackets), which I found so much inspiration in because I love the vibe of grungy and fun street looks. As I've continuously tried to learn more about different designers and looked into more and more runway shows, I've realized that along with experiencing the art and expression of various creative minds and simply marveling at beautiful ensembles, my favorite part of runway shows are that they're a gold mine of inspiration for my personal style. My personal style is ever-developing and is always evolving and changing, and it's really beneficial and inspiring to look at runway looks and see which aspects jump out to me and make me want to amp up my style. To me, a big part of fashion (or anything you do in life, really) is inspiration, which can come from the exchange, expression, and circulation of different peoples' ideas. There are so many creative minds in the world and it's super cool to experience other people's creative expression and draw inspiration from the ideas they're putting out there!